Several from prototype to full scale. The Fri-El seapower system consists of a vessel or pontoon, moored to seabed, to which several lines of horizontal axis hydro turbines are attached. 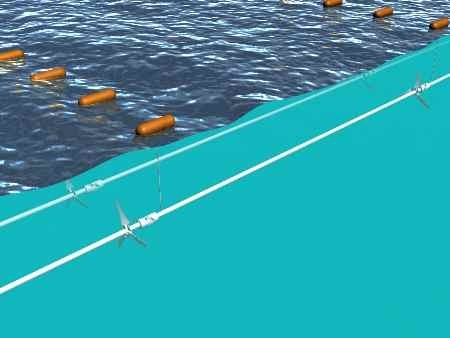 The same pipes, connecting the turbines through cardanic joints providing the necessary flexibility to the system, transfer the power captured from the water on board of the pontoon. Pipes are here connected to electrical permanent magnet generators (PMG) that are kept out of the water in order to simplify and diminish their maintenance. The electric generators transform the power carried by the transmission lines into electrical energy, which can be directly fed into the grid through an undersea cable, connecting the individual floating structures to a submarine hub, which in turn is connected to the shore by a single submarine cable. Alternatively, the systems can be installed offshore far away from the coasts and hydrogen can be produced with the electricity generated by the turbines. Permitting process of the final system (Messina III) has been initiated. After several numerical simulations, a first validation of the studies has been made by testing a prototype of the system in the water towing tank of the Naval Engineering Department of the University of Naples “Federico II”. Soon after the controlled tests, a series of open water prototypes tests have been carried out in the Strait of Messina in order to check the system well working in real conditions. In July 2008, a reduced scale of Sea Power prototype (10 turbines; 6 kW - 2.5 m/s; Messina I) was launched and in 2009 later another bigger prototype (6 turbines; 20 kW - 2.5 m/s) was tested in the same waters (Messina II). Although the final system (Messina III) started to be designed and conceived to produce up to 500 kW with a nominal flow speed of 2.5 m/s in the Strait of Messina the project did not have further development. Fri-El Seapower - Messina Project is located in Italy.